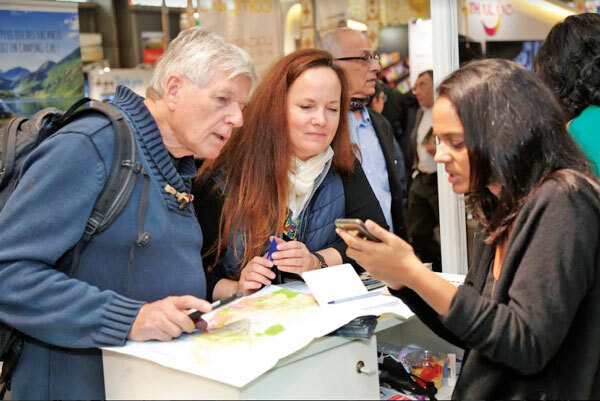 Sri Lanka Tourism participated at the 44th edition of the largest B2Ctravel fair in the French Market, Salon Mondial du Tourisme in Paris, France, which was held at Parc des Exposition, Porte De Versailles recently. Salon Mondial du Tourisme is the largest consumer travel show held in France with the participation of various tourism stakeholders from around the world. The show offers dual exposure to all participating countries through co-hosting Salon Destination Nature (Nature fair) on nature and eco-tourism products taking place parallel to SMT fair in the same venue. Ambassador of France Buddhi Athauda, Audrey Quentin, show director of SMT, Sarangi Thilakasena, Assistant Director of Sri Lanka Tourism Promotion Bureau, Chandima Abeyrathne, and other guests officially opened the Sri Lanka Stand at SMT travel fair along with travel trade representatives participated at the exhibition. Addressing the audience, Buddhi Athauda Ambassador of France, remarked that the popularity of Sri Lanka among French consumers is constantly growing because of it. “Last year Sri Lanka was able to attract over 106,000 French travelers with 10% market growth. This highlights the great potential lying ahead of us to attract more and more French travelers to the country. Travel shows of this nature will expose us to understand our consumers, their travel patterns, travel preferences, various expectations in travelling and moreover the opportunity to have one to one dialogue with them”. Reputed Sri Lankan Travel Agents and hoteliers active in the French market such as Zenith Expeditions, Back Pool Hotels, Yathra Travels, AyubowanTours, Travel Talk Asia, Kanwel Holidays, Crystal Holidays, Reef Villa, Club WaskaduwaHotel, Travel Trends Leisure, Shanthi Travels, Deluxe holidays, Hawk Travels participated at this year’s show. Sri Desi dance troupe from Paris added color and vibrancy with traditional dance performances at the Sri Lanka stand being the cynosure of the show. Ceylon Tea Boutique served freshly brewed Ceylon Tea for the travel show participants throughout the fair promoting the Ceylon tea brand. Sri Lanka Tourism Counter handled large number of inquiries with the inflow of potential travellers ready to visit Sri Lankan in the near future and views suggestions were received by many travellers who wanted to repeat their visit to the country as well. Sri Lanka tourism officials met with leading travel media in France to seek possible cooperation to promote Sri Lanka in these media in future. Further discussions were held with travel agents, PR agencies, Tour Operators, electronic media production houses, bloggers, Travel Guide book publishers, digital marketing companies etc. to promote Sri Lanka in the French market. The 44th edition of SMT welcomed the overall 610 exhibitors and 114 200 visitors in total this year. The distribution of visitors per day is changing compared to last year. More than 91% of visitors had planned trip in visiting the exhibition and 80% of visitors attending the travel fair go on a holiday as per the research.